Darwin Online has been selected for archiving by the British Library and the National Library of Congress as a scholarly work of exceptional importance worthy of preservation. Darwin Online was awarded the prestigious Thackray Medal by the Society for the History of Natural History which writes: 'From a strong field of nominated works, the Society's Prize Committee chaired by the Vice-President Geoff Moore, was unanimous in their selection of "The complete work of Charles Darwin Online" for the award of the Society's John Thackray Medal for 2008. 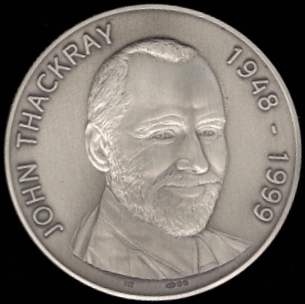 The medal is awarded for a significant achievement in the history of those areas of interest to the Society in memory of John Thackray. ... [Darwin Online is] a monumental achievement: making freely available an exhaustive collection of primary sources and doing so in a way that is easy to use by both novices and experts. The largest collection of Darwin's writings ever published, "Darwin Online" is substantive and rich in content and makes archival material accessible to scholars worldwide. In addition, it is multimedia-based and clever with a minimal use of technology. Since it meets desired standards of accessibility, it will have a value to the public far beyond Darwin scholarship.' 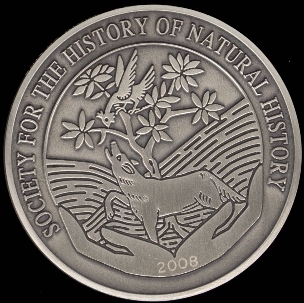 The medal was awarded by the President of the Society, Professor Arthur M. Lucas, at its AGM on 28 March 2009 at the National Museum of Wales, Cardiff. The edge of the medal is inscribed "THE COMPLETE WORK OF CHARLES DARWIN ONLINE"
I will use this opportunity to offer my deepest gratitude for the incredible effort you have put in making Darwin's work, and associated publications, available to the public as an educational tool. Without it the research I am doing on Charles Darwin would have been utterly futile, even though I have accessible to me the hard copies of practically all of his publications. Thank you. The Darwin online collection is amazing; I'm a huge fan, and I use it all the time. Thanks to you and your colleagues for making it all available. Every day I thank god for Darwin Online. "The very BEST site in all the internets." Please allow me to say what a marvelous, incredible, thrilling resource Darwin Online has proved to be. I really can't find adjectives or intensifiers strong enough. Working with it over the last several years has been the most rewarding experience, tremendous, both as a scholar and a someone who loves to spend time with Darwin. It is stunning work. A professor of English, California. to those who enjoy the studies of life. It would be most grateful if that knowledge could sensitize more and more people every day. The public education granted to the children of my country, Brazil, in my opinion, lacks discussion on evolution issues. Therefore, I believe the website can surely help teachers spread its content and encourage the will of learning of our descendants. Through the research of evolution, humanity will surely find its place in nature and know how to admire and live with it. A Student of Biology at Pontifícia Universidade Católica de Minas Gerais. The Darwin Online project continues to be a treasured resource of world literature now made instantly and freely available to the entire world. As an ordinary, science interested citizen, I would like to offer my praise for its construction and management, and my best wishes that the resource of knowledge it represents ever be celebrated with us as a species. In the first place I want to thank you for the excellent work you have done at the "Darwin Online" site. The treatment you gave to Darwin's works on-line is the finest way to present books on the web I have ever seen. I have used the Complete Work of Charles Darwin Online literally thousands of times since the site was launched. For me, as an anthropologist and evolutionary biologist, it is the single best scholarly resource available, of any kind. The sophistication of the search engine always permits me to find the passages I need, in a trice. I am incredibly grateful ... [for] this superb project, which has served so many of us so well, especially in the last “Darwin year”. Thank you very much for creating such a fabulous tool and resource, which truly capitalizes on all the best attributes of modern computing. From the AHRC referee assessment of the Final Report on Darwin Online [for 2005-8 funding]. A "resounding success". "I cannot imagine a better project in terms of value for money. This is a resource closely linked to top-level scholarly research, of clearly international significance, and meeting all the key objectives of AHRC funding, including knowledge transfer. It is a matter for celebration that the AHRC has supported this project." I just wanted to thank you and congratulate you. It's just a superb work! Congratulations to all that made possible this brilliant work. It really brings anybody the possibility to swim in any desired depth in Darwin's world. The design is easy, clear and fast, the intuitivity of the site is excellent, the contents are awesome, the media and image work are just fabulous! A reader from Barcelona, Spain. I used the Complete Work Online extensively while teaching a class on Darwin last academic year, and will use it again for a class this coming year on Darwin's finches. The Complete Work of Charles Darwin Online is undoubtedly the best scholarly website, ever. I appreciate the availability of Darwin’s works. I teach at a Lutheran Seminary and require my students to read Origin of Species and Descent of Man. If theologians are to discuss Darwin’s Theory of Natural Selection and all of the other theories ‘out there’, especially how they relate to the Biblical Creation account, they need to know who Darwin is and, two of his major works. Thanks again. I will use this cite and pass it on to others who are interested learning more about Charles Darwin. Thank you, thank you, thank you for leading this project. I could blather on and on about how wonderful it is to see his work in his own handwriting and his illustrations but, instead let me just say: Thank you. Thank you for your outstanding site. I have a copy of Origin of Species but found reading it online to be so much easier! This is truly a great benefit to future generations. What an incredible website and a remarkable achievement by a large number of people. As it is impossible to thank you all, at least I can thank you. Just a day after going online this document has already been accessed 19,017 times. I know I will be returning to it many, many times in the months and years ahead. First, let me say thank you for your work and the opportunity to read all about Mr. Darwin. I have only yet begun to read the tip of the iceberg; however, I am looking forward to reading every last page. After reading only a mere portion I can only say I am saddened by the lies and misgivings I was taught as a child and I wish I had taken it upon myself sooner to learn firsthand about Darwin and his theories. As a medical professional and a free thinker I have learned that we have a lot more to learn in regards to our universe and the way we heal. Dear Dr. John van Wyhe. Congratulations! The complete Work of Charles Darwin Online is an outstanding project. Congratulations for your effort. This job is an inspiration for the new generations in Science. I just learned about Darwin Online today. As a citizen of the USA i just wanted to thank you for having this important information available for everyone. I'm sure that there will be plenty of complaints from ignorant people also from the USA, so i just wanted to send a letter of support. It has been a true delight to discover your Website. For years I have been compiling information about this fascinating topics. Your hard work in putting together all this information should be commended and recognized. I'd like to thank John van Wyhe and everyone else involved in getting Emma Darwin's diaries online. I listened to the piece on Radio 4 this morning and went straight to my computer and logged onto the site. It's going to take me many hours but I'm determined to look through all the diary entries! I just think it's wonderful that people have taken the time to put these diaries online so that we can access them completely free of charge. Thank you again - I do hope you'll be able to pass this email on. A reader in the UK. Your website was very helpful in dating the copy of Charles Darwin's, Origin of the Species that I have. It was published by Hurst and Company in New York as one of "The Companion Books." According to the information on your website it was possibly published around 1912. A reader from Arizona, USA. I wanted to write to you personally to say how delighted I was to hear of the launch of The Complete Work of Charles Darwin Online. Your project is not only a great academic achievement, but one which has clearly touched millions of people worldwide, as evinced by the global media coverage it has received. Such work can only serve to further enhance the University of Cambridge's reputation for world-class research and innovation and for that I offer you my thanks. What a wonderful resource! It is very exciting to know that I can access these documents so easily. I especially appreciate the images. I just felt I needed to let someone know this is time and money well spent. For me this is what is best about the internet – dispersal of knowledge, access to information. From a high school science teacher, Kentucky, USA. First of all, I would like to express my thanks to you. I came across your complete works of Darwin online, and fifty pages into the first edition/issue of _On the Origin of Species_ I broke into tears, the experience was so powerful. Thank you for your time, your effort and your care in putting works so central to our modern understanding of life up free for the world, undiluted by some intermediary of unwanted analysis. … Thank you again. If nothing else, you have renewed my commitment to the study of natural sciences. A reader from Columbia University, USA. Thank-you and your colleagues for doing this. I live in upper midwest America in a small city of 25-thousand or so. I especially feel the 'small town' limitation when it comes to gaining access to academic and cultural materials. You have just given me access to the Complete Works of Charles Darwin. How can i thank you enough? A reader from upper midwest USA. I and my students thank you for your efforts in developing the Complete Work of Charles Darwin Online, … a very significant contribution to world science and public good. A reader from the University of Lethbridge, Canada. Dear Dr. van Wyhe, I just discovered the Darwin web site and find it fascinating … I do wish to express my appreciation to those responsible for placing this wonderful material on line with free access to all. A reader in California, USA. I simply wanted to express my congratulations for such a brilliant project, especially in a day and age where all sorts of beliefs and superstitions try to discredit Charles Darwin works. Although I am familiar with Darwin's name, I realize that I know very little about his contribution to science and I hope this web site will help me (and eventually my kids) to better understand where we come from as human beings. On accessing the site and entering the search term [for a subject long researched] I was pleased to find numerous excerpts about [it] in his writings additional to the ones with which I am already familiar. A reader in New Zealand.